Description: Growing to 25 ft (8 m) in gardens, this deciduous species has glossy green leaves consisting of up to 10 pairs of leaflets that in fall (autumn) turn yellow, orange and scarlet. The inconspicuous flowers, borne in panicles, are followed in summer by small red spherical seed pods that turn blue in fall and attract birds. 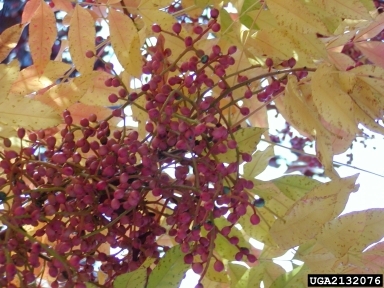 US Habitat: Widely planted as an urban street tree. Also occurs on riversides and in cultivated areas.